PARIS --- It is something of a paradox that, even as the British press is sounding the alarm about planned cuts in the Royal Navy budget, and the possible mothballing of up to half of its frigate fleet, cooperation between Britain and France on their joint aircraft carrier project is proceeding smoothly. “Cooperation has been stepped up. We have redoubled our efforts as this is a crucial phase, and there is a strong will on both sides to reach the next milestone – the French ‘Dossier de Lancement et de Réalisation,’ equivalent to what the British call ‘Main Gate Approval’, by the end of the first quarter,” says an official of MOPA2, the joint subsidiary of DCN and Thales that is prime contractor for the French Navy aircraft carrier project. Shortly before Christmas, the company submitted a binding offer to the French defence procurement agency, DGA, and hopes to follow up by completing the Dossier de Lancement et Réalisation by the end of March. If, as currently planned, the British program reaches Main Gate Approval at that time, an industrial cooperation agreement could be signed and made public during the final Anglo-French ministerial meeting before the French presidential election in April. In France, the DLR marks the start of the detailed design phase, and should lead to the award of a final construction contract in late 2007 or early 2008. The catapults are made in the United States and are being procured through the Foreign Military Sales (FMS) program. Approval of the sale by the Bush Administration, and its notification to Congress, is expected in the coming weeks. Officials involved in the program say there has been a definite improvement in Anglo-French relations in recent months, which makes this ambitious schedule credible. “Cooperation has recently picked up faster than we dared hope,” says a French official. “After completing the preliminary design, we have openly discussed the production phase with the British,” who in recent weeks have closely looked at French production processes and procedures. British teams have visited Saint-Nazaire, where Aker Yards hopes to build the French carrier’s hull, to look at how the company builds its large cruise ships and the French Navy’s BPC amphibious ships. “Cooperation is progressing smoothly both between the two French partners and with the British. In terms of design, we have solved all outstanding technical issues,” says an official of Aker subsidiary Chantiers de l’Atlantique, which now employs several dozen engineers on the project. 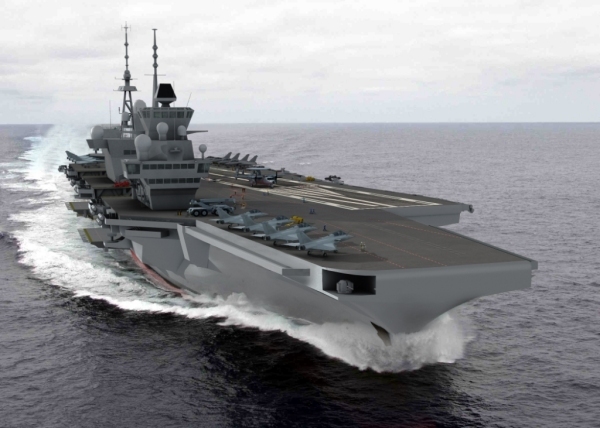 As the British government wants its shipbuilding industry to begin to restructure before it awards the future aircraft carrier (CVF) contract, British yards are looking to benefit from whatever experience the French have acquired in production processes. “We have offered to make our know-how available if British shipyards adopt our production standards and methods,” says one French industry source. In exchange, Britain has agreed to design changes that accommodate French requirements, including provision for larger ammunition storage holds, including special secure storage areas for nuclear weapons, and for hull anti-roll stabilizers, which will not be fitted to the British ships. In addition to joint procurement of components, originally agreed to reduce costs, the adoption of identical standards could lead to the building of common sections for the three ships. No decision has been taken in this respect, but it is being discussed. “The British benefit from working with us as we make things simpler for them, as they do not currently have the infrastructure, the work-force or the organization needed to build ships of that size,” says a French source involved in the program. Could Britain Scrap the CVF Project? If relations between industrialists on both sides of the Channel seem cordial, and dominated by the common interest, fears subsist as to how MoD will accommodate the spending cuts that appear inevitable to pay for the cost of military operations in Afghanistan and Iraq, and cancelling the CVF project is one of the possible savings mentioned by British press reports. “We have seen no sign that the program is being reconsidered,” a French defense ministry spokesman said Jan. 11. Pressure is growing for an agreement between MoD and industry on the cost of the two future CVF carriers, HMS Queen Elizabeth and HMS Prince of Wales. MoD says the estimated cost of 3.8 billion pounds (5.7 billion euros) is excessive, although some observers say this could be a negotiating ploy to obtain a lower price.